If you're gonna get a PC for your living room, you might as well go all out and get one that supports the new high-def DVDs. 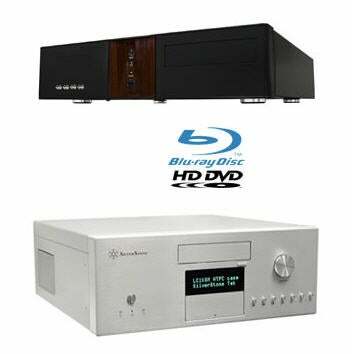 Starting at $2,995, Okoro's BX100 and BX300 can read both Blu-ray and HD DVD discs from a single drive. And that's not all—they're packing some serious tech inside too. They're built around a Intel Core 2 Duo (T7200 or E6600), come with 2GB of RAM standard, up to 1TB of storage and HDCP output via Nvidia's GeForce 8600 GTS video card. My one complaint is they're a little boxy on the eyes, but solid buys otherwise.